Website and processes: 15 Sep 16 Gaynor, 5/5 Excellent "Easy to use website"
Once you are safely strapped in and the engine is warmed up you will be taxiing out to the runway for your first flight. Once airborne your instructor will demonstrate the controls and once flying straight and level it's your turn to 'take control'. Your flight will take you direct to this beautiful market town, it is truly, a wonderful sight from the air, with the Thames meandering along the eastern edge of the Chiltern's through the town under its famous stone bridge and famous Regatta course. Following the River up stream, you past the Royal county town of Reading and Europe's largest wind turbine, then turning north at Pangbourne for the return back to Chiltern Park. 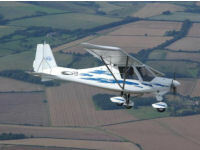 Like all Trial lessons this flight can count as Exercise 3 of the NPPL(M)and can be logged in your logbook on the day. Event takes place at Chiltern Park in Berkshire .